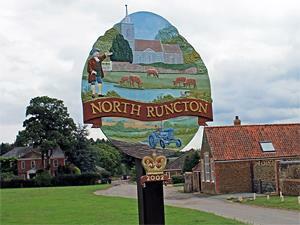 North Runcton01553 763044work VillageNorth Runcton is situated about 4 miles south east of King’s Lynn. In the centre of the village is the green and All Saints' parish church. Also on the green are the buildings which used to house the school and the post office. Evidence from aerial photography and archaeology finds suggests that there had been a settlement in the parish during the Roman period and subsequently Saxon occupation. North Runcton has an entry in the Domesday Book of 1085 where its population, land ownership and productive resources were extensively detailed. All Saints' Church, North Runcton, was built by the architect Henry Bell who also built the Custom House in King's Lynn. At the time Bell lived within the parish at North Runcton Hall. The church is built on the site of the previous church, which was flattened when the tower collapsed in 1701. Most of the exterior is constructed from brick and carrstone but earlier Norman and possibly Anglo-Saxon materials have been incorporated. Easily accessible from the A10 and A47 the village is very well located for visiting historic King’s Lynn as well as all the other attractions of West Norfolk. North Runcton is situated about 4 miles south east of King’s Lynn. In the centre of the village is the green and All Saints' parish church. Also on the green are the buildings which used to house the school and the post office.